A Russian airliner has crashed after leaving Moscow's Domodedovo airport, killing all 65 passengers and six crew on board. The Saratov Airlines jet vanished minutes after take-off and crashed near the village of Argunovo, about 80km (50 miles) south-east of Moscow. The cause of crash is unclear. Investigators and emergency crews are working at the snow-covered site. The Antonov An-148 was en route to the city of Orsk in the Ural mountains. Pieces of wreckage and bodies were found spread over a large area. One of the flight recorders has been recovered, officials say. President Vladimir Putin has expressed his condolences to the victims' families and announced an inquiry into the cause of the crash. 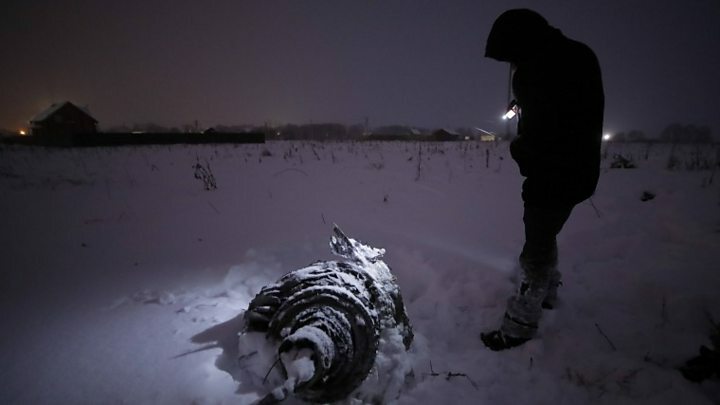 Media captionBBC Russian's Sergei Goryashko: "It's really very difficult... The road is blocked." This is the first commercial passenger jet crash for more than a year - 2017 was the safest year on record for air travel. The plane took off at 14:27 (11:27 GMT) on Sunday. Contact was lost four minutes later. Flight-tracking site Flightradar24 said it then descended at the rate of 1,000m (3,300ft) per minute. Eyewitnesses told Russian media that the jet was on fire as it plummeted. Investigators said the causes they were considering included weather conditions, human error and technical failure - but they did not mention the possibility of terrorism. Who was on the plane? The official list of passengers and crew has been published (in Russian) by the emergencies ministry. 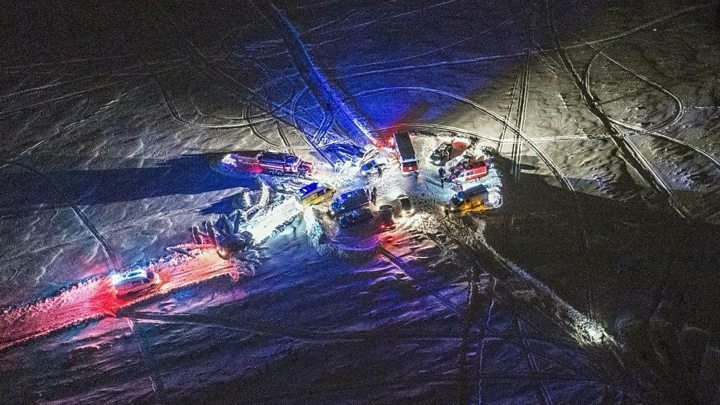 A child and two teenagers were among the passengers, all but three of whom were from the Orenburg region where Orsk is located, city mayor Andrei Odintsov told Tass news agency. Two passengers were from Moscow and a third from St Petersburg, he added. At Orsk airport, a girl whose brother was on the plane was shouting "Bring me back my brother! ", Novaya Gazeta newspaper reported. A man sat sobbing over his mobile phone. What do we know about Saratov Airlines? Saratov Airlines is based in Saratov, 840km south-east of Moscow. In 2015 it was banned from operating international flights when surprise inspectors found someone other than the flight crew was in the cockpit. The airline appealed against the ban and changed its policy before resuming international charter flights in 2016. It flies mainly between Russian cities but also has destinations in Armenia and Georgia.